NETWORKING—The Regency at Hualalai in Kailua-Kona hosted the first AfterHours for 2019. Organized activities included tours of the facility’s studio, one and two-bedroom apartments; the newly refurbished pool and interacting with Regency residents—including 98-year-old Bob. Kona-Kohala Chamber of Commerce (KKCC) attendees enjoyed a hot and cold pupu buffet provided by the Regency’s culinary staff. 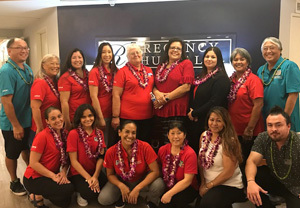 Faith Gianan of Regency at Hualalai said the facility is one of 44 long-term health care and senior housing communities throughout the western U.S. overseen by Regency Pacific Management. 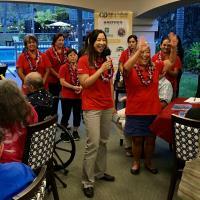 The Kona location offers assisted living options such as medications management; memory, respite and hospice care; and independent living for seniors. Accommodations include daily meals, weekly housekeeping and linen service, transportation to medical appointments and shopping trips, a social program and on-site staff 24/7. Wendy Laros, KKCC executive director, said she knows first-hand the benefits of living at Regency as her mother-in-law, Gail, lives there. “I know how wonderful this place is,” she shared. The next AfterHours is 5-7 p.m. Wednesday, Feb. 20 with YWAM Ships Kona in Kailua-Kona. Part of Youth with a Mission, YWAM Ships brings services and practical needs to isolated communities that are accessible only by watercraft. Signup at www.kona-kohala.com or phone 329-1758. NEW YEAR AFTERHOURS HOSTS—Regency at Hualalai staff greeting AfterHours attendees included from front left: Elena Cabrera, Kalena Stevens, Alena Gamiao, Lynne Daimaru, Mae Ulep and Robert Reichling; from back left: Delbert Smith, Gayle Masada RN, Callie Isaia, Faith Gianan, Donna Jaques RN, Michelle Thompson, Michelle Tokita, Andrina Uemoto and Clyde Kutsunai. Not pictured: Vern Leibelt and Bernie Nastor. Photo by Pam Latinis.